BEIRUT (AP) — A bomb blast at a border crossing between Syria’s opposition-held Idlib province and Turkey killed at least 10 Syrian rebel fighters on Sunday, activists said, as a wave of airstrikes pounded the region and fighting raged in the contested northern city of Aleppo. The Britain-based Syrian Observatory for Human Rights said a suicide bomber struck a bus transporting fighters through the Atmeh border post, one of several crossings Syrian rebels use to bring in fighters and supplies. The monitoring group, which relies on activists inside Syria, said the attack killed 10 fighters. A media activist in the province said the blast killed 40 people. The activist, who spoke on condition of anonymity for fear of retribution, said some 200 rebels from various factions are based near Atmeh and bring in weapons through the crossing. Idlib is dominated by ultraconservative Islamic insurgents, including a group linked to al-Qaida. The Observatory had earlier reported 26 airstrikes on Sunday across Idlib, one of the last remaining opposition bastions. Observatory head Rami Abdurrahman said Russian and government airstrikes on the province have intensified since rebels launched a campaign from Idlib to break a government siege of Aleppo’s opposition districts on July 31. The strikes have killed 122 civilians, he said. Another 327 civilians, including 126 children, have been killed in fighting in Aleppo province, according to the Observatory. The toll includes 126 people killed by rebel shelling of government-held parts of Aleppo city. 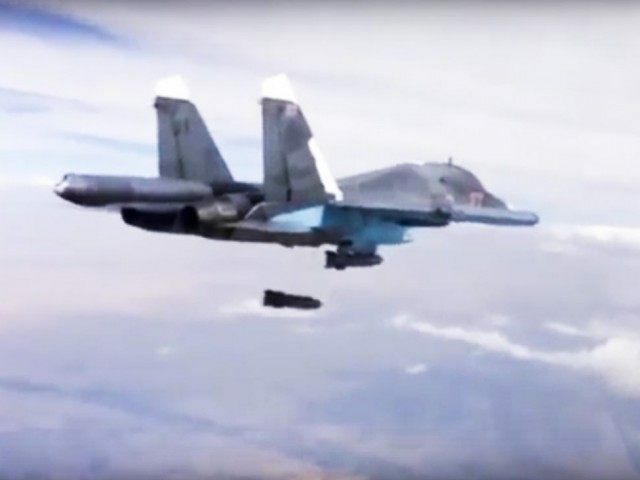 The Local Coordination Committees, an activist network, said Russian jets struck the towns of Jisr al-Shaghour and Binnish, while the Observatory reported strikes on the provincial capital, Idlib. It was unclear how the activists identified the planes. Aleppo, once Syria’s largest city and commercial capital, is now the focal point of the civil war. The rebel campaign, spearheaded by ultraconservative factions including the al-Qaida-linked Jaish Fatah al-Sham, formerly known as the Nusra Front, has drawn manpower from Idlib, some 30 kilometers (19 miles) to the west. A spokesman for the ultraconservative Ahrar al-Sham faction confirmed that the rebels were drawing recruits from Idlib. “The battle for Aleppo concerns all of Syria,” said Abu Khaled, who gave only his nom de guerre. At least 97 rebel fighters from Idlib have died in combat in Aleppo since July 31, according to Abdurrahman. Aleppo is still home to some 2 million people, most of whom live in the government-controlled western districts. Tens of thousands of Syrians displaced from Aleppo have found refuge in Idlib, home to a pre-war population of 1.5 million. On Sunday evening, rebels opened a new front, sending a truck bomb into Aleppo’s western Zahraa neighborhood, according to the Twitter account of the Islamic Front, one of the factions fighting for the city. The Observatory reported fighting in the city’s western and southern districts. To the east, a Kurdish-led force known as the Syria Democratic Forces drove the Islamic State group out of the strategic town of Manbij on Saturday and announced a new campaign against al-Bab, a nearby town held by the extremists. The U.S. has provided the SDF with air cover and American special forces are advising them on the ground. Moscow has been waging an air campaign in support of government forces for nearly a year. Russia’s military said six long-range Tu-22M3 bombers that took off from Russian territory carried out strikes Sunday on IS near the eastern Syrian city of Deir el-Zour. It made no mention of any strikes in Idlib. Elsewhere in Syria, rebels and government forces battled around a major power plant in the central Hama province. State media reported that rebels inflicted heavy damage to the Zaara generating station, while an opposition media activist in the nearby town of Aqrab said the power plant was not targeted. Obeida al-Hamawi, of the activist-run Hama Media Center, said government forces had launched an assault from positions near the plant to retake the village of Zaara, captured by rebels earlier this year. He said electricity was still being supplied to the area. The Observatory reported heavy clashes in the area. In the south, rockets set two apartment blocks on fire in a besieged, opposition-held suburb of Damascus. The local council in Daraya accused the government of using incendiary weapons, and posted videos showing volunteers transporting water tanks on tractors to help firefighters battle the blaze. The Observatory also reported a government rocket attack on the suburb. Following an international appeal, the Syrian Arab Red Crescent evacuated a 10-year-old girl from the besieged Damascus suburb of Madaya to receive urgent care after activists say she was shot by a pro-government sniper on Aug. 2. Syrian state media said “terrorists” shot Ghinwa Qweider and then prevented her evacuation. Amnesty International said the government held up the request for nearly two weeks.